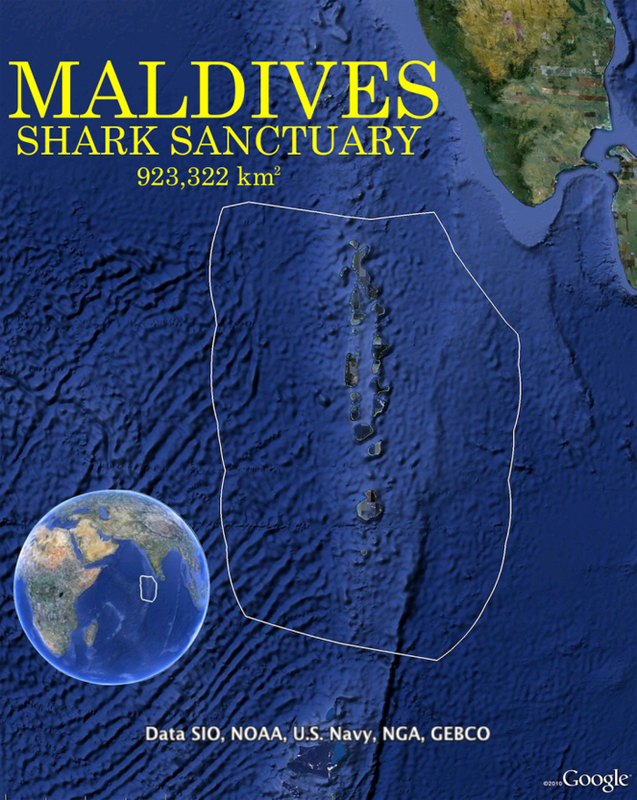 2 March 2010 – In a move lauded by the Pew Environment Group the Maldives today declared its exclusive economic zone (EEZ), 90,000 square kilometers of the Indian Ocean, as a shark sanctuary free from all shark fishing and also banned all imports and exports of shark fins. The Maldives is home to more than 30 shark species, including the scalloped hammerhead, the most prominent shark to be considered for protection at the upcoming meeting of the Convention on International Trade in Endangered Species (CITES). “Shark tourism” is a growing sector in the Maldives and in many other countries. In 2006, the Australian government’s Reef & Rainforest Research Center conducted a survey of visitors to the Great Barrier Reef and estimated that up to 25% (or $1,375) of each visitor’s expenditure was directly attributable to the opportunity to see sharks. More than 40% of the tourists said that hammerheads were the top shark that they wanted to see. The Maldives beaches and coral atolls account for 28% of its GDP. But fishing is also a growing industry in the country’s EEZ and a direct competitor with ecotourism for resources. Thirty percent of shark species are threatened or near-threatened with extinction and up to 73 million sharks are killed every year around the world for the shark fin trade, largely for shark fin soup. Two of the CITES shark proposals, for scalloped hammerheads (and four look-alike species) and oceanic whitetips (also found in Maldives waters), will address this threat head-on. The PEW Charitable Trusts – The mission of the Pew Environment Group, the conservation arm of The Pew Charitable Trusts, is to help meet what we view as one of the seminal challenges of our time: saving the natural environment and protecting the rich array of life it supports. Our aim is to strengthen environmental policies and practices in ways that produce significant and measurable protection for terrestrial and marine systems worldwide. In doing so, we work to advance scientific understanding of the causes and consequences of environmental problems, design innovative policy solutions to these problems and mobilize public support for their implementation.